To support the Palestinian oppression goes against Christianity’s understanding of justice. 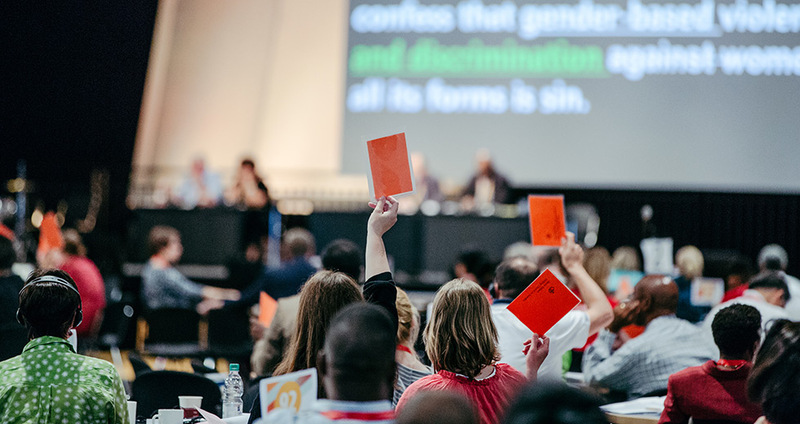 In a bold vote for clear actions, the General Council of the World Communion of Reformed Churches (WCRC) made it clear that such theology goes against the heart of the Bible. 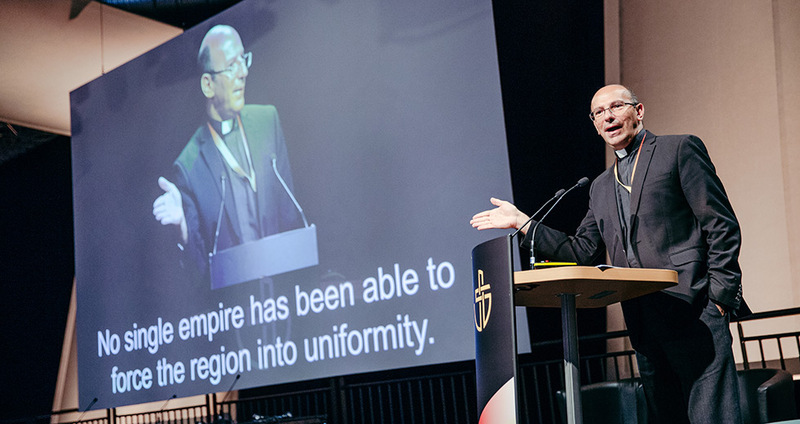 This global body, representing over 80 million Christians, held its 26th General Council from 29 June – 7 July in Leipzig, Germany. As the WCRC’s highest decision-making body the General Council issued a resolution with meaningful, action-driven solidarity and not only words of support. Although many Christians in the world still believe Israel’s lies and/or uphold Zionist theology, the tide is turning. 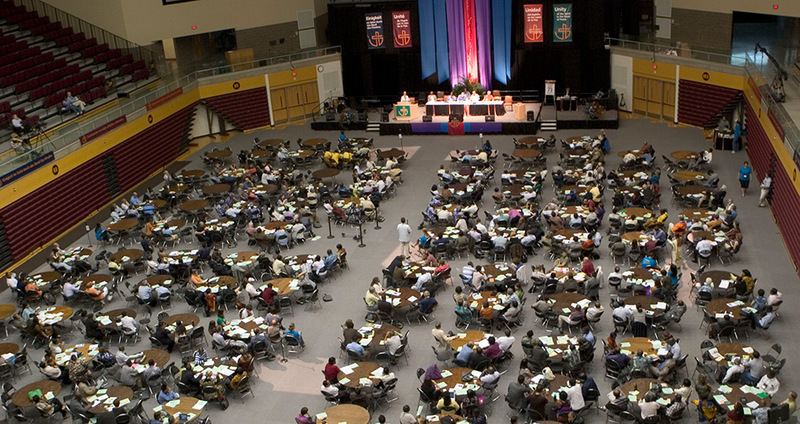 The WCRC General Council stated unequivocally that “the integrity of Christian faith and praxis is at stake” since the Christian faith has been used to justify the oppression of the Palestinians. It rejected any use of the Bible “to legitimize or support political options and positions that are based upon injustice, imposed by one person on another, or by one people on another” as it strips the Word of God of its ”holiness, universality and truth”. The General Council agreed to initiate a programme of study and discernment on the theology used to legitimate the oppression of the Palestinian people, recognizing that such a study might result in the need for “prophetic action”. Over 30 members from more than 10 countries drafted the proposal that served before the WCRC’s Public Witness Committee. Their proposal was debated and refined by the Committee in several sessions before it served before the delegates in the plenary asking their permission to submit the proposal to a decision making process. 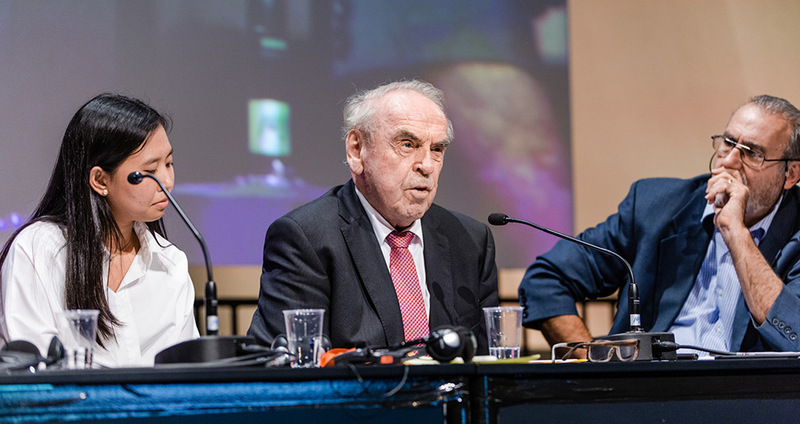 This decision was granted and in a next step hundreds of delegates from Asia, the Caribbean, Latin America, Africa, the Pacific, the Middle East, North America and Europe debated the resolution with its action points in discernment groups before casting their votes in a subsequent plenary session. It was most encouraging that the voting was in favour of all six action points in the resolution. Although there was a fair amount of abstentions, no-one voted against any of the points! This means that no-one raised dissent in public. Among other measures, the General Council instructed the WCRC Executive Committee to respond to the letter of 21 June 2017 from the National Coalition of Christian Organizations in Palestine (NCCOP) indicating what actions can be taken in response to the NCCOP cry for “costly solidarity” (see also Robert Cohen’s brilliant blog on “costly solidarity”). In their open letter to the ecumenical movement, the National Coalition of Christian Organizations in Palestine has called the situation “on the verge of catastrophic collapse” declaring that this the “last chance to achieve a just peace… and to save the Christian presence in this land.” They asked for honesty about Israel’s widespread abuse of international law. “We need brave women and men who are willing to stand in the forefront. This is no time for shallow diplomacy.” The General Council committed to respond to this letter indicating what actions can be taken in response to the Palestinian cry. A South African, Rev. 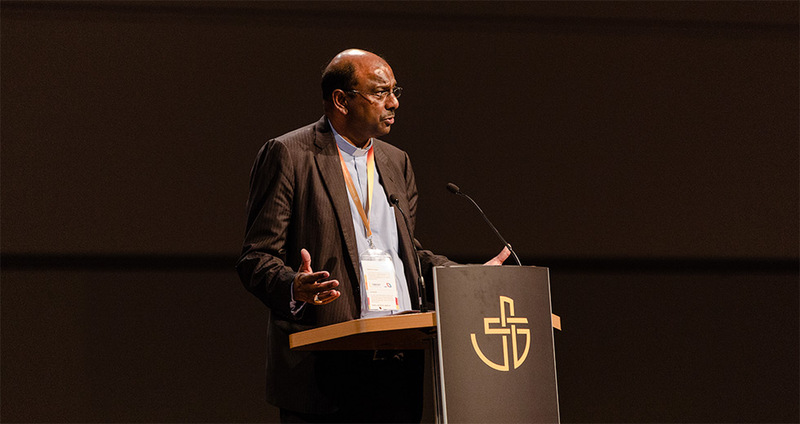 Dr Jerry Pillay, from the Uniting Presbyterian Church in Southern Africa served as president of the WCRC at the time of the 2017 General Council. Hearty congratulations to Rev. 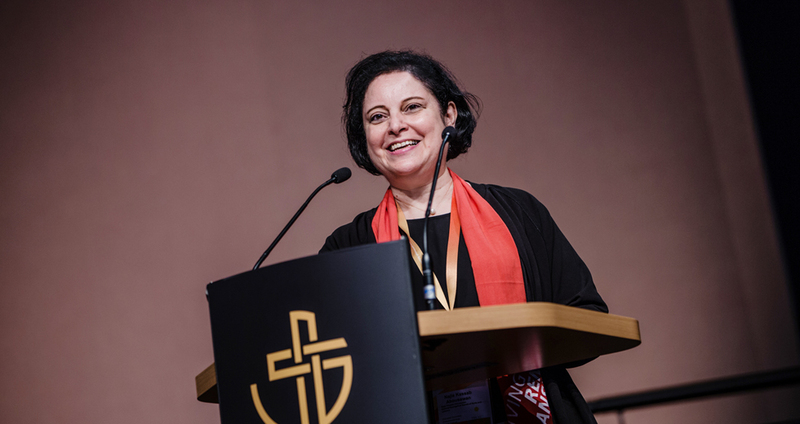 Najla Kassab, a minister in the National Evangelical Synod of Syria and Lebanon (NESSL) who is the newly elected president of the World Communion of Reformed Churches (WCRC). South African churches who sent delegates to the 2017 WCRC General Council include the Uniting Reformed Church in Southern Africa/Verenigende Gereformeerde Kerk in Suider-Afrika, United Congregational Church of Southern Africa (UCCSA), Uniting Presbyterian Church in Southern Africa, Dutch Reformed Church (DRC)/Nederduits Gereformeerde Kerk (NGK), Evangelical Presbyterian Church in South Africa, Nederduitsch Hervormde Kerk van Afrika/ Dutch Reformed Church in Africa (DRCA)/(NGKA), Maranatha Reformed Church of Christ. The WCRC decision follows a recent call from South African and Canadian Churches at the World Council of Churches’ Jubilee conference in Bethlehem on 20-22 June 2017. At this meeting they publically recognised Israel’s practices of apartheid and colonialism in respect of Palestine. This year marks 69 years since the creation of the State of Israel, and the General Council can reaffirm its commitment to justice, peace and security for the Israeli people and state. The creation of the State of Israel had a significant consequence: the loss of homeland for the Palestinian people, and the creation of 750,000 Palestinian refugees. It is also 50 years since the 1967 Israeli occupation of the West Bank, Gaza and East Jerusalem. It is time for Israelis and Palestinians to live alongside each other in peace, security and justice. In an open letter to the ecumenical movement published on June 21, 2017, the National Coalition of Christian Organizations in Palestine has called the situation “on the verge of catastrophic collapse” declaring that this is the “last chance to achieve a just peace… and to save the Christian presence in this land.” They have appealed to the world church for costly solidarity with them to end their oppression and gain their freedom, through solidarity visits, reviewing theology, economic actions, and support for their freedom to exercise their religious, social and political rights. Many of us have seen with our eyes and heard with our ears the painful realities of life for Palestinians. We have been witness to the daily, grinding humiliation of women, men and children; the deaths of civilians; the demolition of homes; the confiscation of water resources; the isolation and ongoing diminution of the Palestinian population of Jerusalem; severe restrictions on freedom of movement, education, commerce, electricity, healthcare, and access to holy places; the unlawful practice of administrative detention, including of children; and the taking of land through the construction of illegal settlements and a separation wall built on Palestinian land. Palestinians who live in the State of Israel, while citizens with the obligations of citizenship, also suffer injustice through discriminatory policies in housing, employment, and more. The re-configuration of Jerusalem in particular jeopardizes the historical place and shared identity of Jerusalem, which is part of its holiness. We acknowledge and confess that the Christian faith has been used to justify the injustice against the Palestinian people. Any use of the Bible to legitimize or support political options and positions that are based upon injustice, imposed by one person on another, or by one people on another, strip the Word of God of its holiness, its universality and truth. All who suffer share in the groaning of the Holy Spirit for the liberation of all peoples and their joining in one spiritual communion. The ongoing condition of occupation, and the continuing denial of Palestinian rights has cast a shadow over generations of Jewish Israelis who have borne the social, psychological and spiritual burdens of the role of occupier. Affirms that with respect to the situation of injustice and suffering that exists in Palestine, and the cry of the Palestinian Christian community, that the integrity of Christian faith and praxis is at stake. – Collect studies and materials that speak to the cry of the Palestinian people, and to make them available to member churches. ­- Undertake study and discernment, using the resources available from member churches and the ecumenical movement, regarding theology that has been employed to legitimate the oppression of the Palestinian people, recognizing that such a study might result in the need for prophetic action. Instructs the Executive Committee, with the Secretariat, to respond (before the end of 2017) to the letter of June 21, 2017 from the National Coalition of Christian Organizations in Palestine indicating what actions can be taken in response to their cry for costly solidarity. Encourages member churches to examine their mission, education, and investment relationships with Israel and Palestine in light of the witness of Palestinian Christians and to respond as they understand the Reformed communion’s commitments to human rights and the protections of international law. Instructs the Executive Committee to encourage and support (with practical help from member churches) delegations to visit the region to connect with the present day Christian community – the “living stones”- of the Holy Land, to witness their situation and express support for their desires for freedom and self-determination. Encourages the Executive Committee to seek to strengthen initiatives for dialogues, civil peace services, mediation, conflict prevention and transformation. Thanks for this Marthie. I am currently involved in a project looking to bring savings as investments for renewable energy. The promoter is the Evangelical Church of Westphalia. The champion in the Church, of this project, is quite high up in the hierarchy of the Evangelical Church in Germany. I will be sending him the link to your blog and ask him for his response. He was also in Leipzig where the Evangelical Church held its big meeting and I guess this was the event which you attended. The renewable energy project also links to other African countries particularly Rwanda, Tanzania and the DRC. As you know Rwanda is strongly pro-Israel. I was there last October on this project and left behind a copy of “Why Israel?” with one of he church leaders, to give a different anti-Zionist perspective. But there is clearly strong Israeli influence with Kagame. I also picked up that there are questions around the 1994 genocide in terms of who shot down the plane that ignited this horror, how many Hutus were killed and by whom, and about many Hutus killed on the run in the DRC after Kagame’s ascension to power. . All these questions are apparently verboten in Rwanda, under pain of being convicted for the crime of genocide denial. Sound familiar? Thanks Paul. Your comments on Rwanda are most interesting. I’m very aware of how the majority (but not all) Germans and other Europeans feel that they let Jews down by being honest about Israel’s abuses. But why side only with those Jews who oppress the Palestinians? Why not choose the side of justice and those Jews who are honest about Israel’s oppression of the Palestinians? As one of our South African delegates said in Leipzig – if Europeans and others don’t speak up about Israel’s human rights abuses they REPEAT their silence during the Holocaust/Shoah!